** Instrumental mix of 52nd STREET - 'Cool As Ice' used for outro Hacienda venue footage. Notes: All tracks live at The Hacienda Club, Manchester. 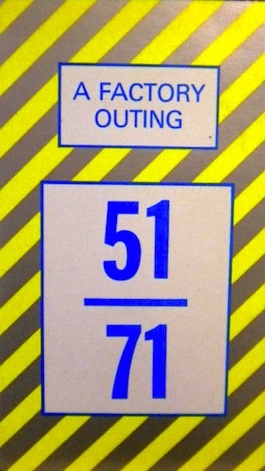 (Thus "51/71" cover graphic.) All videos directed by MALCOLM WHITEHEAD. Later releases with sticker stating: Special Notice: Ikon regrets that The Wake and Quando Quango soundtracks have had to be removed due to insistence of Island Music Ltd. Equivalent to Factory FACT 71.